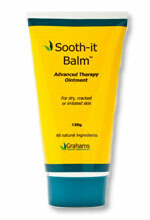 For those with extremely dry skin the Sooth-it Balm is an all natural product designed to sooth dry, itchy skin. Its mild nature makes it an excellent option for children with sensitive skin. Sooth-it Balm penetrates deep into the skin to relieve dryness whilst providing a protective barrier over the skin. Caprylic Triglyceride*, Grape Seed Oil, Lanolin Alcohol, Safflower Seed Oil, Triglyceride Wax*, Coco Glycerides*, Cetyl Palmitate*, Sorbitan Isostearate*, Silica, Emu Oil, Sunflower Seed Oil, Flaxseed Oil, Beeswax, Vitamin E.
As with any product being used for the first time the Sooth-it Balm should be patch tested before use.